For the sake of comparison, let us first examine a market that most folks are probably very familiar with: the stock market. By its very nature, the stock market tends to be very monopolistic. There is only one entity, one specialist that controls prices. All trades must go through this specialist. Because of this, prices can easily be altered to benefit the specialist and not traders. In the stock market, the specialist is forced to fulfill the order of its clients. Now, let’s say the number of sellers suddenly exceed the number of buyers. The specialist, which is forced to fulfill the order of its clients, the sellers in this case, is left with a bunch of stock that he cannot sell-off to the buyer side. In order to prevent this from happening, the specialist will simply widen the spread or increase the transaction cost to prevent sellers from entering the market. In other words, the specialists can manipulate the quotes it is offering to accommodate its needs. Unlike in trading stocks or futures, you don’t need to go through a centralized exchange like the New York Stock Exchange with just one price. In the forex market, there is no single price that for a given currency at any time, which means quotes from different currency dealers vary. “So many choices! Awesome!”This might be overwhelming at first, but this is what makes the forex market so freakin’ awesome! The market is so huge and the competition between dealers is so fierce that you get the best deal almost every single time. And tell me, who does not want that? Also, one cool thing about forex trading is that you can do it anywhere. It’s just like trading baseball cards. You want that mint condition Mickey Mantle rookie card, so it is up to you to find the best deal out there. Your colleague might give up his Mickey Mantle card for just a Babe Ruth card, but your best friend will only part with his Mickey Mantle rookie card for your soul. Even though the forex market is decentralized, it isn’t pure and utter chaos! At the very top of the forex market ladder is the interbank market. 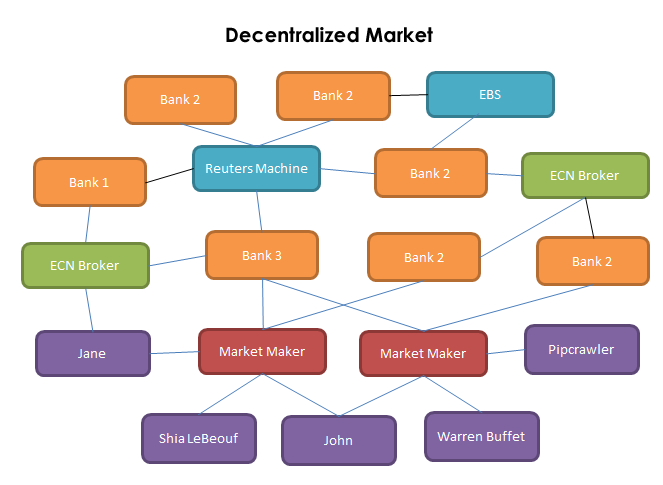 Composed of the largest banks in the world and some smaller banks, the participants of this market trade directly with each other or electronically through the Electronic Brokering Services (EBS) or the Reuters Dealing. The competition between the two companies – the EBS and the Reuters Dealing – is similar to Coke and Pepsi. They are in constant battle for clients and continually try to one-up each other for market share. While both companies offer most currency pairs, some currency pairs are more liquid on one than the other. For the EBS plaform, EUR/USD, USD/JPY, EUR/JPY, EUR/CHF, and USD/CHF are more liquid. Meanwhile, for the Reuters platform, GBP/USD, EUR/GBP, USD/CAD, AUD/USD, and NZD/USD are more liquid. All the banks that are part of the interbank market can see the rates that each other is offering, but this doesn’t necessarily mean that anyone can make deals at those prices. It’s like asking for a loan at your local bank. The better your credit standing and reputation with them, the better the interest rates and the larger loan you can avail. Next on the ladder are the hedge funds, corporations, retail market makers, and retail ECNs. Since these institutions do not have tight credit relationships with the participants of the interbank market, they have to do their transactions via commercial banks. This means that their rates are slightly higher and more expensive than those who are part of the interbank market. At the very bottom of the ladder are the retail traders. It used to be very hard for us little people to engage in the forex market but, thanks to the advent of the internet, electronic trading, and retail brokers, the difficult barriers to entry in forex trading have all been taken down. This gave us the chance to play with those high up the ladder and poke them with a very long and cheap stick. Now that you know the forex market structure, let’s get to know them forex market playaz!